I love José Pizarro’s food. 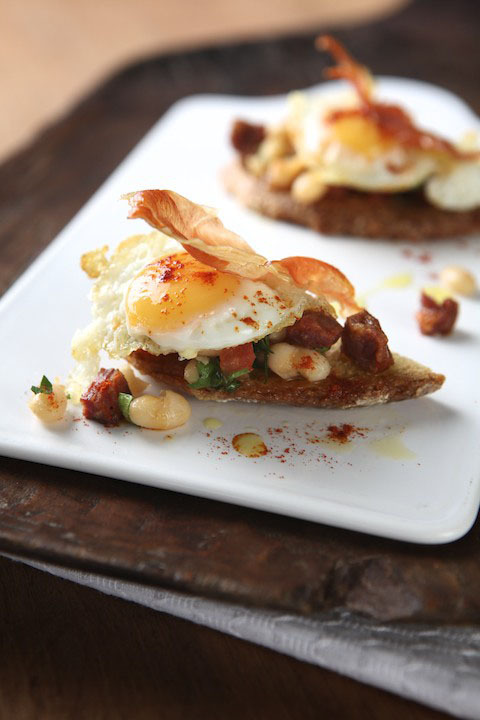 Spanish tapas through and through, his cooking is soulful and delicious, simply yet refined. My favourite of his restaurants is his flagship self-named José on Bermondsey Street. The food is not only fabulous and reasonably priced, but the restaurant also has a wonderful intimate feel to it. Don’t get me wrong, I thoroughly enjoyed his second restaurant Pizarro as well (also on Bermondsey Street), but the original is a pretty special place. And it’s not just me who enjoys José’s food. His restaurants have also won a string of awards including Newcomer of the Year 2012 and Restaurant of the Year 2012 from Food and Travel Magazine, and Restaurant of the Year 2012 from The World Food Awards. Chef Pizarro recently teamed up with Barcelona’s renowned cava brand, Codorníu, to launch a special Great British Tapas Project. 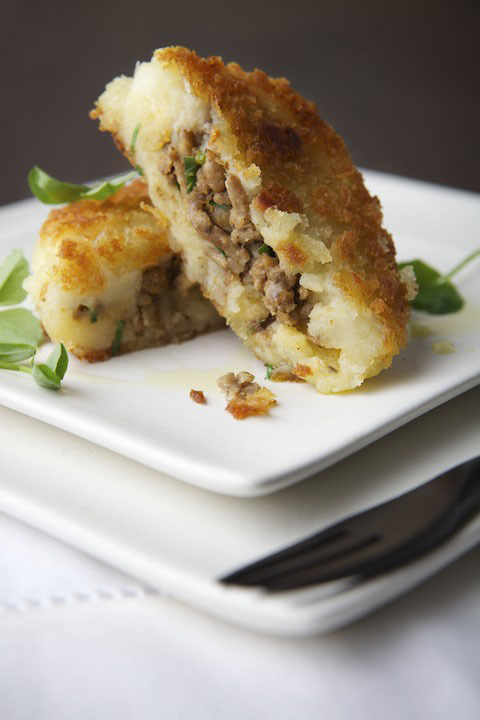 A nationwide survey was commissioned by Codorníu cava to determine the UK’s top five most-loved dishes. 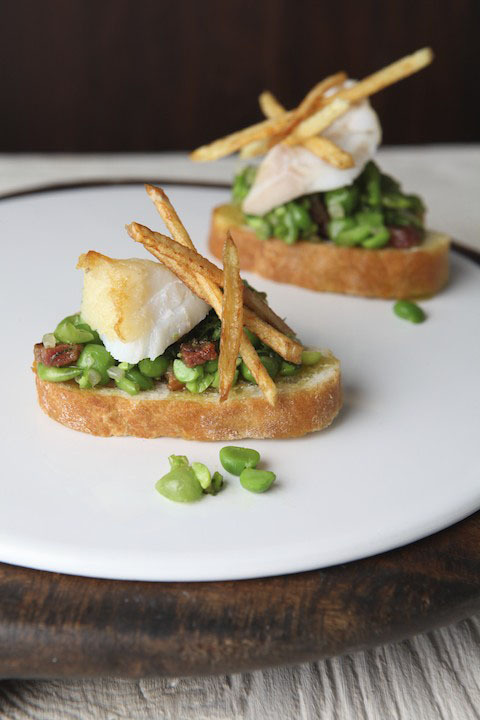 José was then to transform these much loved British dishes into tapas with a Spanish twist. So in order of preference, the top five dishes most loved by the British are roast beef and Yorkshire pudding, apple crumble and custard, fish and chips, a full English and shepherd’s pie. With these results, José managed to come up with some amazing gems at the launch of The Great British Tapas project at Pizarro Restaurant earlier this week. 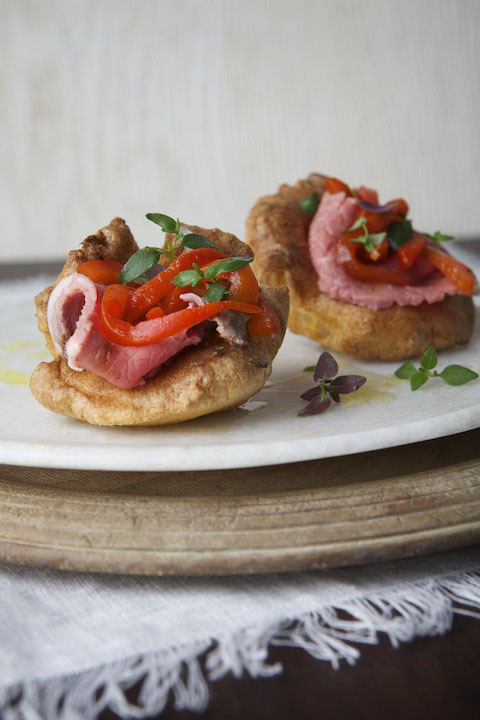 The roast beef, placed in a mini Yorkshire pudding, was cooked medium rare. It had a wonderful flavour, was incredibly succulent and had been touched some with pimentón for added flair. The fish and chips were interesting in that José had used salted cod, a Spanish twist that I really enjoyed. Topped with chips, it sat on some tasty peas on toast that might have worked better had they been mushy rather than whole so they didn’t roll around so much. The full English consisted of a lovely pan-fried quail’s egg, Serrano ham and haricot beans perched on some toasted English sourdough. This was delicious too, but my favourite was the shepherd’s pie croquetas that consisted of juicy minced lamb encased in a lovely mashed potato and then crumbed and deep-fried. The result was spectacular, with the lamb being moist and tasty, the mash being light and fluffy, and the crumbs providing a wonderful crunch. This was a tapas dish that José should definitely add to his menu! Finally, José’s take on the apple crumble was in the guise of a crème Catalan that proved to be smooth and creamy. There were definitely some Great British Tapas inventions to be had during this evening. As ever, José’s food was fabulous. Alongside the food we sampled the Codorníu Brut and Rosado NV cavas. Both were delicious and worked well with the tapas. Codorníu comes from the Bodegas y Viñedos Codorníu Raventós winery and is situated about 40 miles from Barcelona. Founded in 1551, in the 1870s the winery started to apply the ‘Traditional’ or ‘Champagnoise’ method to create their first bottle of sparkling wine. Originally called ‘Xampagnet’, its name evolved in the 1970s to become what we now call cava. The delicious cavas certainly helped to round off a really tasty evening. gosh, it all looks so tasty. 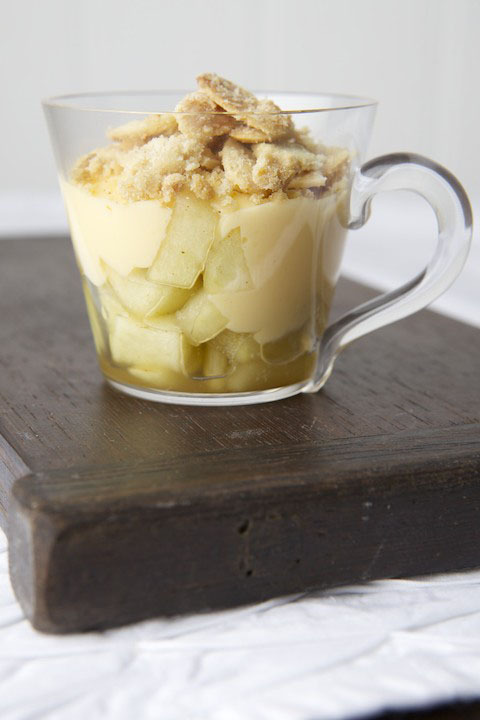 I’m in Spain at the moment, and very tempted to cook the Apple Crumble Creme Catalana for guests tonight. Thanks for the inspiration! I have the recipe if you want it!